Thermal imaging cameras from FLIR Systems are increasingly being used in industrial environments for predictive maintenance inspections. Perhaps the fastest growing predictive maintenance technology on the market today, thermal imaging allows companies to immediately identify faults and fix them before they disrupt the production process. Predictive maintenance inspections also allow companies to avoid the unnecessary costs involved in carrying out preventive maintenance wherein every piece of equipment is replaced at regular intervals to prevent breakdowns. Predictive maintenance inspections carried out using thermal imaging technology enable condition monitoring inspectors to accurately determine whether a piece of equipment needs to be replaced or not, ensuring continuity of production is guaranteed without unnecessary equipment replacement. Speed of problem detection in the mechanical and electrical systems of a plant is a major advantage of thermal imaging, enabling swift inspections. Thermal imaging is also practical in plant systems involving several pieces of equipment or components. A thermal imaging camera can be used to swiftly scan the components saving time. Gunther Willems, Technology Manager at Coservices, one of Europe’s largest condition monitoring consultancy agencies vouches for the capabilities of a thermal imaging camera, saying that it is simply the only technology that allows one to immediately ‘see’ what’s wrong. 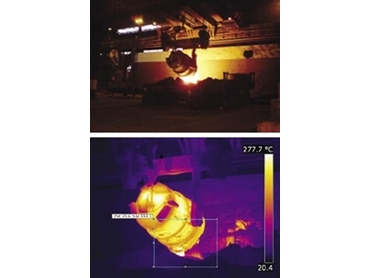 According to Willems, for some types of equipment such as refractory linings, for instance, thermal imaging is the only practical condition monitoring tool available. Why did one of the largest condition monitoring consultancy agencies choose FLIR? Ergonomic design was one of the reasons for Coservices to opt for FLIR thermal imaging cameras for their work. Given the number of times they have to use the equipment for their condition monitoring business, it is important for the company to assess the camera’s ergonomics and ease of use. All FLIR thermal imaging cameras are relatively compact, lightweight and easy to use, says Willems. The interchangeable optics of the FLIR T-Series is also an important factor as it can be very difficult to do everything with just one lens. Switching between different lenses in space constrained or hazardous locations can be difficult. Being able to make easy lens switches in the FLIR T-Series thermal imaging cameras gives the operator much more flexibility. The intuitive operation of thermal imaging cameras enables users to learn quickly. However, it is important to understand the various functions of the technology to avoid getting false conclusions. FLIR Systems provides top-of-the-bill training in co-operation with the Infrared Training Center (ITC). Willems adds that all their maintenance consultants are required to at least follow the level 1 ITC training course. FLIR Tools is a powerful, free software solution that helps users present their findings to decision makers effectively. FLIR Tools provides both PC and Mac users the tools to quickly import, edit and analyse images, and turn them into convincing, professional PDF inspection reports, ready to print or email. FLIR Tools Mobile is an intuitive application for smart phones and tablets for importing, analysing, managing and sharing thermal images from FLIR's Wi-Fi enabled infrared cameras. FLIR Tools+ provides a comprehensive set of infrared tools, with several cutting-edge controls including recording and play-back of radiometric video files, and time-temperature plotting. FLIR software is completely compatible with Microsoft Office. FLIR Systems Australia offers a comprehensive range of thermal imaging cameras in the Australian market.